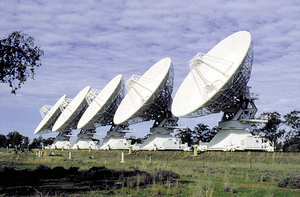 The Australia Telescope Compact Array was officially opened by Prime Minister, Bob Hawke on 2 September, 1988. The array comprises six antennas (five shown here), each 22 metres in diameter. Located near Narrabri in NSW, it can be linked to another antenna near Coonabarabran, and to the Parkes radio telescope. Such linking creates a virtual telescope hundreds of kilometers in diameter, able to see much more detail than any of the individual telescopes.